(CNN) -- China has recorded its third bird flu death this year after a 16-year-old boy died in central China on Tuesday morning. Police close a poultry market on January 9 in north China's Hebei province. The official Xinhua news agency said the boy, who had fallen ill on January 8, died in the city of Huaihua in the central Hunan province. The country's Ministry of Health moved to allay fears over the outbreak, saying that although further human bird flu cases were possible throughout China, there wouldn't be a large-scale outbreak, Xinhua and CCTV said. On Saturday, a 27-year-old woman from eastern China died of bird flu, Chinese authorities said, making her the second person to die this year from the deadly virus. The woman fell ill on January 5 in Shandong province on the country's east coast and died on Saturday, the Ministry of Health said in a statement. Two tests on the woman were positive for H5N1 avian influenza, said the ministry, which did not say how she might have contracted the virus. In addition, the World Health Organization said a 2-year-old girl in northern China had tested positive for bird flu. The girl fell ill on January 7 in central Hunan province and was taken to her home province of Shanxi in northern China, the state-run news agency Xinhua said. The report did not say how she became infected. On January 5, a 19-year-old Beijing woman died of bird flu after handling poultry, officials said. Xinhua said the woman bought nine ducks at a market in Beijing's neighboring Hebei province and cleaned their organs before falling ill. Since the end of 2003, the H5N1 virus has infected numerous species of birds in more than 60 countries in Asia, Europe and Africa. It has not been found in birds in North or South America or the Caribbean, according to the Food and Agriculture Organization of the United Nations. Human-to-human transmission of avian flu is rare, but in some cases the virus has passed from poultry to humans. It has killed more than 200 people since 2003. 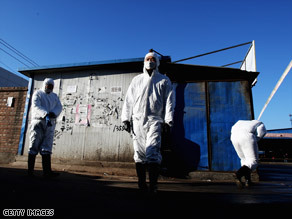 China reported its first human-to-human infection case in 2005. On Friday, China announced it was setting up a nationwide network to test for the virus.